Zoroaster (dates ?) - Zoroastrianism is one of the more mysterious religions in history. Primarily because so little is known about it, and its founder. It was the official religion of all three pre-Islamic Persian empires; Persian, Parthian and Sassanid. And though it has few followers today, it still survives to the present. Before Zoroaster, it is believed that the people of the region practiced a religion very similar to Hinduism, which is quite logical. Both early Indians and Iranians originated from the same people, Indo-Aryans. When they separated about the middle of the 2nd millennium B.C. they developed different cultures, traditions and their religions began to diverge as well. Of course, with the life of Zoroaster, it shifted drastically altogether. Who was Zoroaster? He's about as mysterious as Homer. He is commonly recognized to be Persian, though even that is not for certain. The best evidence is that he was born somewhere in the eastern Iranian Plateau sometime in the 7th century B.C.. The name "Zoroaster" is the Greek transliteration of an Old Avestan word Zarathustra. Old Avestan is an East Iranian language associated strictly with Zoroastrianism. In fact, Zoroastrian scripture is called the Avesta. It is inferred from his name that he came from an upper to middle-class background. People in many cultures in ancient times were named for their vocation. The last half of Zoroaster's name, -ustra, means "camel" in Old Persian, implying that he may have come from a family of shepherds. But sometime at a young age he became restless and left his family in search of answers to life's questions. Tradition holds that at the age of 30, while standing on the bank of Daitya River, he received a remarkable vision. A figure many times the size of a man appeared before him and claimed to be the archangel Vohu Manah, which means "Good Thought". He took Zoroaster into the presence of Ahura-Mazda, the "Wise Lord". Ahura-Mazda proceeded to instruct Zoroaster in the ways of the true religion. Life was a struggle between good and evil, Ahura-Mazda was the force of good in the world, and Angra Mainyu was the "destructive spirit", the force of evil. The two forces were engaged in an eternal conflict. Ahura-Mazda charged Zoroaster with spreading the truth among mankind. For years he tried, and largely failed. His fortunes changed, however, when he converted a prince named Vishtaspa. From then on, "Zoroastrianism" as it came to be known spread rapidly throughout the region; and once Persia conquered much of the known world, it became a world religion. 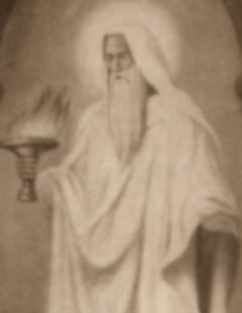 Zoroaster himself died at the age of 77, but the faith endured his death. One more important point, although most of the Avesta was written long after Zoroaster's life, one portion, known as the Gathas, is attributed to him. They are a collection of hymns.